MR Online | Who Needs an Islamic State? Abdelwahab El-Affendi is a well-known Islamic scholar and political philosopher from Sudan, presently based in London. Author of numerous works, his latest book, provocatively titled Who Needs an Islamic State? discusses what he regards as the serious lacunae in contemporary Islamist political thought, which, in his view, have caused Islamist movements to reach a virtual dead end, creating many more problems (for Muslims as well as others) than they have been able to solve. El-Affendi seeks to argue the case for a paradigm shift in Muslim political thinking in order to fashion a contextually relevant understanding of Islam and its role in, and relation to, the public sphere. Islamism may be described as a version of Islam predicated on the centrality of the notion of an “Islamic state” whose principal function is to enforce, and rule by, what is conventionally regarded as shariah law. Islamism is far from being the homogenous phenomenon that it is often taken to be. Nor are all versions of Islamism necessarily incompatible with democracy. Undeniably, however, many forms of Islamism are. Islamist ideologues, driven by triumphalist, even apocalyptic, fervor, have failed to a develop consistent position on such crucial issues as limits to state authority, people’s participation in law-making and governance, the role and status of non-Muslims and women, and the question of violence. Almost all recent experiments in setting up “Islamic states” have involved tremendous bloodshed, conflict, and large-scale suppression of democratic rights, including of Muslims themselves. The tantalizing utopian society that Islamists promise to usher in seems to recede even further into the realm of possibility once Islamists come to power. This, in brief is what El-Affendi argues in his book. He contends that, once in power, Islamist parties inevitably turn sternly authoritarian. This is inevitable, he suggests, because the leaders of these parties firmly believe that their understanding of Islam corresponds most closely to the Divine Will and hence cannot be opposed and must be imposed, even against the opposition of a significant section of the population, Muslims as well as others. Islamists in power generally have a very poor record of respecting democracy, though the author rightly notes, it is unfair to blame them alone for the serious democratic deficit in much of the Muslim world since they are more often than not the victims of despotism, both of Western imperialist powers and of regimes in Muslim counties closely allied to the West. Yet, he insists, even victims have choices. When out of power, the “misguided anti-democratic rhetoric” of Islamists provides many a despot with “an alibi and a pretext to oppose democratisation,” and in the few instances when Islamists have managed to acquire power, their record in upholding democratic rights has generally been dismal. El-Affendi believes that values underlying democracy, such as justice, fairness, decency, rational conduct, can be said to be in “total harmony” with a certain broad and inclusive understanding of Islam. The anti-democratic thrust of much contemporary Islamic political thought is thus not a necessary outcome of Islam itself. Rather, the he argues, it owes much to the fact that Islamism emerged as a response to Western colonialism and the collapse of the Ottoman Caliphate at the hands of Western powers. That historical context in which it emerged favored an authoritarian vision of state. Yet, El-Affendi says, that model of the state is outdated and does not do justice to the demands of Islam, for it miserably fails to guarantee justice and basic freedoms that, in his view, Islam insists upon. At the same time, he is not unmindful of the present imbalance of power at the global level that is heavily tilted against Muslim countries. One way to address the problem, he suggests, is for at least one leading Muslim state to be set up or promoted that would be accepted by other Muslim countries as a sort of leader, in the same manner in which the USA is accepted as the leader of the West. This would be less ambitious than the classical Muslim Caliphate, and would fall short of leading to a European Union sort of arrangement, though it could eventually lead to it. Such a state, which should be a viable democracy with a strong economic base and vibrant cultural life, could, he believes, play a major role in addressing the endemic instability of the Muslim world. He holds this out as a realistic alternative to the utopian vision of the Caliphate in Islamist circles. While defending democracy and the rights of minorities, El-Affendi does not advocate that Muslim countries uncritically adopt Western-style secular, democratic state structures. In fact, he is bitterly critical of the modern state, which, instead of serving society, demands that society serve it. He draws inspiration from the polity set up by the Prophet Muhammad, which was, he says, characterized by voluntary participation, and was based on morality rather than coercion. The ideal polity established by the Prophet was, however, subverted shortly after the Prophet’s demise, when the proto-democratic Caliphate was transformed into authoritarian monarchy that heralded the collapse of the idealist project. This, El-Affendi notes, resulted in the decline of the role of the wider community in political affairs and the further narrowing of Muslim political theory. It was at this time that doctrines were invented, including by some court-related ulema, making obedience to rulers compulsory even if they were tyrants. This justification that was sought to be bestowed on tyranny remains a greatly problematic aspect of Muslim political thought. Another major drawback of traditional Muslim and modern Islamist political theory is, El-Affendi tells us, that since it is based on the notion of the Caliph as a virtually saintly leader, there are no proper checks and balances to his powers. The insistence on perfection in the Caliph, he perceptively notes, “has automatically removed from the community the right to criticize him, for everyone is by definition less pious, less learned and less wise than he is.” The solution to the problems of the Muslim ummah was believed to depend on the arrival of an individual saintly ruler, which is precisely what leaders of various Islamist groups and Muslim messianic movements projected themselves as. The waiting for this “impossible arrival” was, El-Affendi comments, “bound to relegate Muslim thinking to the realm of mythology and passive ineptitude.” He suggests that Muslim political theory be revised by detailing the ideals inherent in Islamic history and norms in a more realistic fashion, and by insisting that they be adhered to in practice. El-Affendi is bitterly critical of the tendency in Islamist circles to project the Caliphate as an end in itself, rather than as a means to certain desirable ends, such as justice and democracy. He finds fault with key Islamist ideologues, such as Maududi and Syed Qutb, for their aversion to democracy and their advocacy of a totalitarian, fascist-like state in the name of the Caliphate, whose ruler would be advised by a shura council but who could override its opinion. This would allow him to be a virtual dictator. In such a set-up, El-Affendi argues, totalitarianism would be further reinforced because the Caliph and the state he presides over would be charged with the responsibility of promoting virtue and combating vice, which could easily result in malpractices as well as gross interference in people’s private affairs. This, in turn, would surely lead to people opposing the Islamic state, as the experience of numerous countries where such experiments have been sought to be imposed so tragically illustrates. In this regard, El-Affendi argues for effective checks on the powers of the Caliph or amir or leader of the Muslim state, because, he says, the conventional notion that the Caliph cannot be a tyrant because only the most pious persona can be selected for the post is wholly unrealistic. He notes that some scholars suggest that the amir be bound by the consensus (ijma) of the ulema, but he prefers to concur with the suggestion of Hasan al-Turabi, head of the Sudanese Muslim Brotherhood, who argues that the amir should follow the ijma of the people, whose choice should be enlightened by religious as well as secular experts. El-Affendi also approvingly refers to the noted Tunisian Islamist Rashid al-Ghanoushi, who stresses that Islamist movements should consider themselves as just one among many actors within a liberal-democratic state and that they should regards themselves neither as the guardians of Islamic morality, nor as the sole authority as regards the interpretation of Islam. In other words, an Islamist party must shed its monopolistic tendencies and see itself as just another political party offering its program to people, inviting them to decide freely between it and its rivals. In such a scheme of things, Islamic parties must acknowledge that there is always a possibility that they could lose to non-Islamic parties in freely held elections, and they should respect the verdict of the electorate. Another key aspect of Islamist political thought that El-Affendi scrutinizes is its vision of the state that is based on the notion of what he aptly terms “a principle of restriction,” which he contrasts with the original Islamic vision of the polity as based on “a principle of liberation and self-fulfillment.” This model is based on the notion of a benevolent autocrat who rules mainly though punitive powers. Not surprisingly, this model has throughout Muslim history been used by despots to shore up their own legitimacy and powers. Another crucial flaw of this model is what he terms as the “totalitarian quasi-utopian vision in which the Islamists conceive of a mighty state dragging an unwilling community along the path of virtue and obedience to the law.” This is reflected in their concern mainly with legal prohibitions and restrictions in the law. The citizen that Islamists seek to mould is essentially someone who is deprived of the freedom to sin, but, ironically, also one who lacks the freedom to be virtuous either. El-Affendi argues that this was certainly not God’s purpose when He created human beings endowed with free will. The issue of community identity in an Islamic state also remains a subject of intense debate, El-Affendi points out. While many Islamists insist on following the medieval fiqh tradition in treating non-Muslims as dhimmis, with several restrictions on their rights, he refers to some Islamist ideologues who are now willing to revise the notion of dhimmi and consider non-Muslims as co-founders of the state and as full citizens with equal rights as Muslims. This reflects a growing realization that the division of the world in the classical fiqh tradition between dar ul-harb (‘Abode of War’) and dar ul-islam (‘Abode of Islam’) is a post-Quranic development that has no sanction in the Quran. El-Affendi eagerly supports the notion of dar ul-ahd (‘Abode of Treaty’) that some Muslim scholars have proposed, connoting states where communities agree to peacefully coexist. In such states, democracies where Muslims have equal rights, including the right to follow and propagate their faith, there can be no room for armed jihad, and Muslims must seek to cultivate peaceful and harmonious relations with non-Muslim fellow citizens. This, however, does not mean, El-Affendi clarifies, that Islam is reconciled to the present Western-inspired international order, for, he says, it must play its role of being the sole remaining major challenger to the liberal-democratic Western-dominated international system in order to establish justice, first within Muslim communities and countries, and then, internationally. Similarly, with reference to the notion of ummah, which some radical Islamists argue must translate into political unity of all Muslims across the world, El-Affendi chooses to side with those Muslim thinkers who consider that the notion does not preclude allegiance to a particular state. True, he argues, a Muslim’s ultimate loyalty must be to God, not to a community or state. Yet, other loyalties, such as to the family, tribe, nation, and country, need not be seen as necessarily contradictory to this ultimate loyalty. This is why, he says, Islam recognized these other facets of identity, but sublimated and gave them a new expression within the new context of belief. In some ways, he adds, modernity and the modern system of nation-states can actually help advance some Islamic ideals. In theory, modernity allows for democracy, freedom (albeit one controlled by social responsibility and spiritual welfare), justice, and peaceful interaction between different peoples, thus promoting the creation of a truly global community, which, El-Affendi says, is in accordance with Islamic teachings. In this regard, Islam, properly understood, can play an important role as a source of moral guidance to create a peaceful and just world order and to end the present heavily-skewed global imbalances of power and resources. El-Affendi sees this as part of the mandate of a community that regards itself as a “witness over mankind,” which should manifest itself in transcending self-interest in favor of global responsibility, attacking consumerism, nurturing the environment, and offering an alternative to the international order based on the notion of the egotistic nation-state as a collection of individuals and groups motivated largely by narrowly-defined self-interest. These notions should, he argues, be recast in a moral context by redefining the role of the Muslim ummah as the conscience of mankind. One of El-Affendi’s serious concerns with traditional as well as contemporary Muslim political thought is that it does not adequately provide for formal decision-making mechanisms suitable for a complex, modern state. One reason for this is that both are based on the model of the small-scale and closely-knit polity established by the Prophet in Medina, which, in turn, was built on a society characterized by mutual trust, close personal interaction, and easy, mainly face-to-face communications. The charismatic nature of the leadership provided by the Prophet made it unnecessary to have formal decision-making structures that would require all leading figures to take part in the political process. Today, however, El-Affendi notes, the situation is vastly different, and more institutionalized and formal arrangements for decision-making and power-sharing are required in order to administer large nation-states. This is something that Muslim political thought has not devoted sufficient attention to. In this context, El-Affendi argues that that the idea of a single Caliph, so central to traditional Sunni political thought, may have to be replaced in favor of rule by a council of people, a system more in tune with the concept and realities of the modern state. El-Affendi is also critical of the Islamists’ tendency to hanker after a single saintly hero, in the model of an ideal Caliph or a Mujaddid, or a Mahdi, who could, almost miraculously, solve all the problems of the Muslims in particular and the world in general. He rightly regards this as misplaced utopianism, pointing out the impossibility of applying political techniques suitable for small city states to vast countries. The classical Sunni caliphate model that both traditional ulema and Islamists seek to recreate, he insists, belongs to the category of republican city-states of the past and is unworkable in today, in a world of vast, multi-ethnic, modern states. A key aspect of the practice of modern Islamist movements that El-Affendi finds greatly problematic is their near obsession with ruling through restriction, control, and punishment, rather than through working for the positive enablement of their citizens. This has made for proto-fascist tendencies to emerge within their ranks, ultimately causing the very people whom they supposedly wanted to reform in the name of Islam to oppose and even, as in some places, revolt against them. This, so El-Affendi says, was not the original Islamic idea of a political community and can only be counterproductive to the cause of building up a truly moral Islamic society and polity. By seeking to “establish” Islam through coercion, and thus making capture of the state and its coercive powers their first or major concern, Islamist forces might thus only be causing their own downfall, El-Affendi argues. Their harsh, authoritarian approach to enforcing Islamic morality can only lead to corruption and widespread hypocrisy, causing alienation from, rather than genuine commitment to, Islam. This means, El-Affendi writes, that the search for an ideal state must begin with the search for freedom for Muslims, including the freedom to think, to act, to even sin, and to repent, to find oneself and one’s fulfillment in obeying God — only then can a truly righteous Muslim community and state emerge. This requires that, for the present, Muslims must participate wholeheartedly in the struggle for democracy, for right of every individual not to be coerced into doing anything against his or her will. Only in this freedom will society be able to evolve an ethics based on the Prophetic model, wherein people submit to Islam voluntarily and abide by its rules by their conscience, not through fear of the state and its agencies of punishment. At the same time, El-Affendi adds, the freedom that he advocates is not one without moral restraints. To be free is not to be amoral. Rather, it means to be free from external, undesirable constraints. Yet, to be genuinely free also requires that the state must not be totalitarian, contrary to how several modern Islamist ideologues have conceived of it. The ideal Muslim state, as well as the Muslim community in general, does have the duty to help each individual achieve his or her moral potential, but it cannot shoulder the individual’s ultimate duty with regard to his or her own actions. El-Affendi recognizes that for any political community to function there has to be an element of coercion involved, but, he says, the ideal polity cannot approve of any element of coercion other than the minimum inherent in the principle of community itself. The Muslim state or the Muslim community cannot compel people to be righteous against their will, for that would only lead to hypocrisy, which Islam abhors. This is also a sure recipe for despotism, as the state, imagining itself to be the instrument of the Divine Will, can easily assume its moral duty to be to compel people to act against their own conscience. In other words, then, the state must be a democratic one, based on the free will of its citizens and the principle of peaceful resolution of differences and free debate about the demands of Islam and the operation of the community. It should also respect cultural and religious pluralism and accommodate non-Muslims as equal citizens with equal rights and freedom. El-Affendi argues the case for a polity in a plural society as being an association of independent religious communities coexisting with each other, governed by a treaty rather than by a rigid Constitution in order to give the communities greater autonomy. Such a treaty would detail the rights and duties of all communities and would safeguard their common existence, similar to the covenant of Medina that brought the Muslims, under the Prophet, with the non-Muslim communities of Medina, in a common polity. This would be a different sort of polity to the conventional modern state. Communities would join together not as subjects of an all powerful state, but as members of communities united voluntarily, each pursuing its own way of life in full freedom. This polity would allow for only that much coercion as is needed to safeguard and maintain the polity itself, but coercion would not the basis of the polity. In such a polity, a person would be free to join the community and polity of his or her choice or leave freely, something that is absent in the current international order, where citizens must conform to state-dictated norms and where freedom of movement to join other polities is severely restricted. In place of the territory-based modern state, El-Affendi suggests a polity which is not strictly territorial and an international order based on peacefully co-existing communities rather than territorially-based and mutually exclusive nation states. It would not be an intrusive, coercive organization that seeks to impose specific norms. Instead, it would be a co-operative association to help people to live freely according to the dictates of their conscience. It would conform to the shariah, but the shariah would not be imposed. Rather, the conformity to the shariah would be to the extent of the free expression of the free will of its Muslim citizens. Such a state is to be distinguished from conventional states in that it has a higher moral purpose. It should, El-Affendi says, serve as a light for all humankind, and not being engrossed, as all other states are, in an endless search for comforts and material goods for its people. It must be characterized by a philosophy of giving and sharing, unlike conventional states, whose component groups vie with each other for the maximum possible self-aggrandizement. This brings El-Affendi to the greatly controversial issue of the imposition of the shariah. He persuasively argues that attempts to force Muslims to abide by the shariah have inevitably failed in the past and have even proven counter-productive. In this regard, then, conventional Islamist political thought is gravely lacking. The shariah, El-Affendi says, can rule only through the willing consensus of Muslims, when the community observing it perceives it as a liberating act, as the true fulfillment of the self. In other words, since the shariah must entail willing compliance to its rules, in actual fact it can never be imposed, whether by the state, an Islamist party, or Muslim clerics. When it is imposed against the will of the people, it is no longer shariah. When only coercion, not consent, underpins the rule of the shariah, it becomes hypocrisy. The issue of the enforcement of the shariah by the state also shapes the way in which Islamists conceive the state itself — as almost an end in itself, or, at least, as the principle means to enforce the shariah. El-Affendi points out that this displaces the role of individuals in establishing justice, making social activity, including the dispensation of justice, dependent on the will of rulers, who can thereby easily turn into despots. Islamists often take the state as end in itself. And, since the Islamist party or the “Islamic” state comes to be seen as an end in itself, in many cases self-styled Islamic movements have exhibited an unfortunate tendency of allowing their ends to govern their means, not stopping from engaging in blatantly un-Islamic and criminal acts, such as killing innocent people and engaging in terrorism, in order to achieve what they regard as noble ends. El-Affendi insists that Islam does not allow for this sort of approach at all. 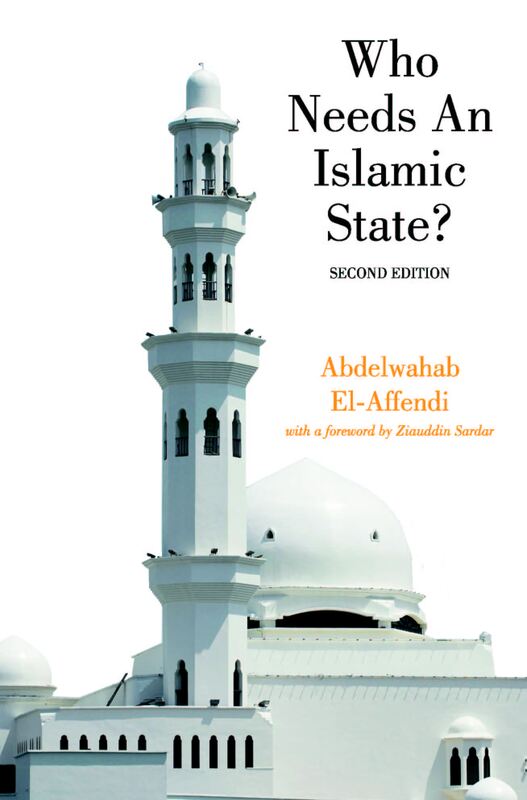 El-Affendi is particularly critical of modern Islamist ideologues, such as the Egyptian Syed Qutb and the Pakistani Abul Ala Maududi, who conceived of an ideal Islamic state as being totalitarian, anti-democratic, authoritarian, and coercive. He is bitter about what he calls the Islamists’ “self-righteous pretensions,” which translates into “a readiness to resort to violence at the slightest pretext.” He likens them to the Khawarij or Kharijites, an early splinter group from among the Muslims, who saw themselves alone as true Muslims, and the rest of the world, including other Muslims, as deviant, aberrant, even anti-Islamic, thus ruling out any room for compromise. While still upholding the notion of a Muslim state molded or guided by religio-moral concerns and principles, el-Affendi points to the serious gaps in modern Islamist political thought, indicating the way forward for the emergence of a genuinely democratic, pluralist, and contextually-relevant Muslim political discourse. Yoginder Sikand works with the Centre for the Study of Social Exclusion and Inclusive Social Policy at the National Law School, Bangalore.